PDF has been the most popular document format since I started using the Internet. The PDF files can be read on any computer or mobile device and you even don’t need to install Adobe PDF Reader like a few years ago. Nowadays, your web browser and operating system (both Windows and MacOS) already have built-in PDF support and you don’t need to install any other software. 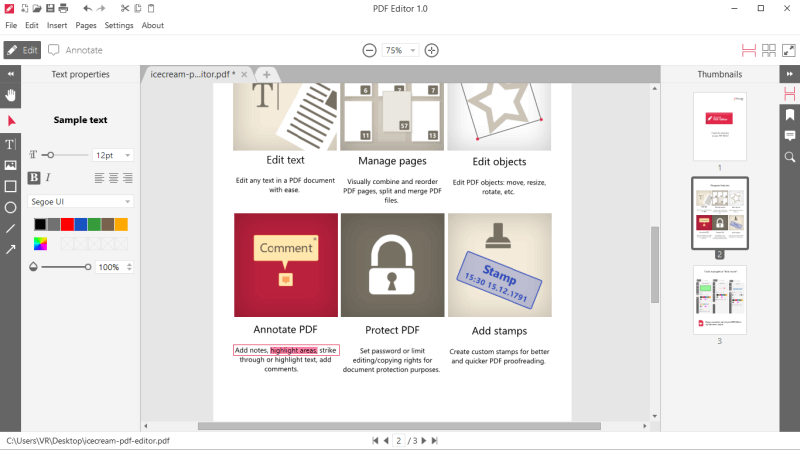 The built-in readers are really helpful as they are lightweight and don’t need huge resources when viewing PDF files. However, they lack advanced features to edit and manage those files. You just can draw, sign, or add text and markups on top of the documents; You can’t actually edit the content of the files. Icecream PDF Editor is an advanced tool to help you edit text, add notes, redact, protect files, manage pages and much more. In the video presentation below, you will see that the software is a powerful solution for editing your PDF files. As long as you have a clean PDF file which is not poorly scanned from physical documents, you will be able to edit its content effortlessly. You can edit text, move, rotate, resize, delete any object, add images and shapes, annotate, or manage pages. Amazingly, the developer is making the software 100% free and you can download it right now. It is available on Windows at the moment but I hope the Mac version will be released soon. Once you open the software, you will need no time to get used to the simple UI. The tabbed UI allows you to work with multiple documents at the same time. On the left side, you can find a rich set of editing tools which allow you to manipulate the PDF documents in all the possible ways. Apart from the editing and annotating tools, you can also set passwords to prevent unauthorized access, add stamps, add watermark, or draw shapes, arrows, and lines on the documents. The Icecream PDF Editor is completely free and we recommend it if you need to edit your documents.